I now have three pairs of Saint Crispin’s shoes: the alligator/calf wing-tips pictured above; brown-suede chukka boots; and most recently a pair of dark-brown suede cap-toes. 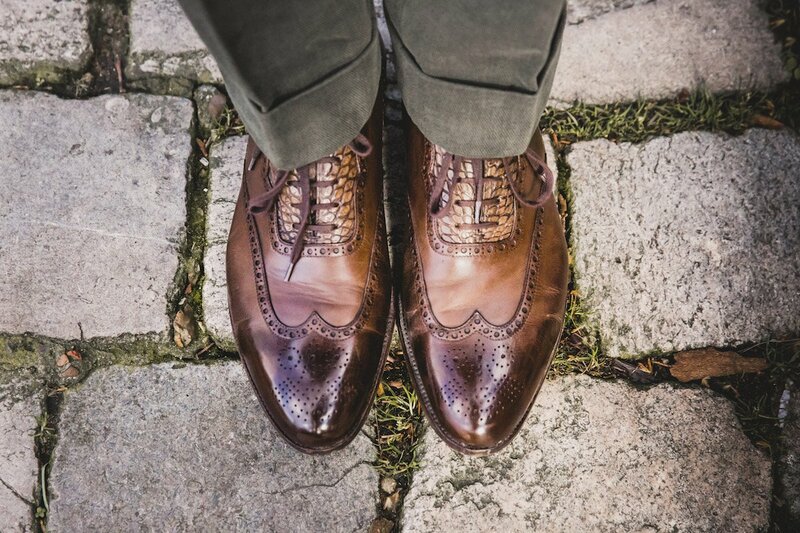 I have ordered steadily and regularly, each time gaining in confidence based on my experience with how the shoes have aged, and on the consistency and service of the Saint Crispin’s team. We had a couple of real issues with the first pair, as mentioned in my review. But those were corrected (that pair being re-lasted) and it is telling that when I received my second pair and my third, those same issues were still fixed. Given that this gradual creation of a perfect fit is such an attraction of bespoke, it’s incredible how many bespoke artisans are inconsistent with it. Although Saint Crispin’s at this level isn’t strictly speaking bespoke, they absolutely succeed in this regard. In this post I wanted to focus on two other points that are distinct about Saint Crispin’s, and upon which my thinking has developed over the past two years. In that first review, I mentioned how stiff Saint Crispin’s shoes are to start with. This is largely down to how they hand-peg the waist of the shoe, and then use a longer, firm stiffener through the waist. When you first put a pair on, and for the first dozen or so wears, this feels pretty constrictive. In my review I said it was the one thing I wasn’t sure I could ever get used to. Two years later, my opinion has probably changed. 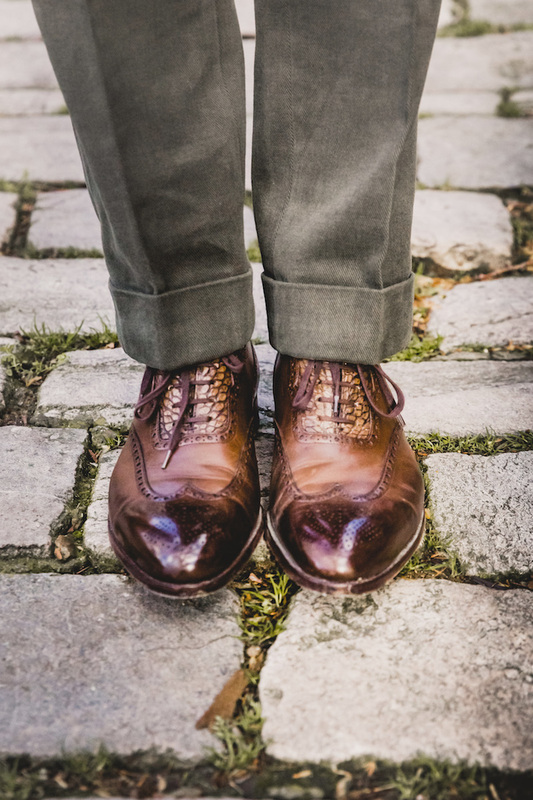 Those first wing-tips are just as comfortable as any other shoe, but are more supportive and have a cleaner look through the waist. 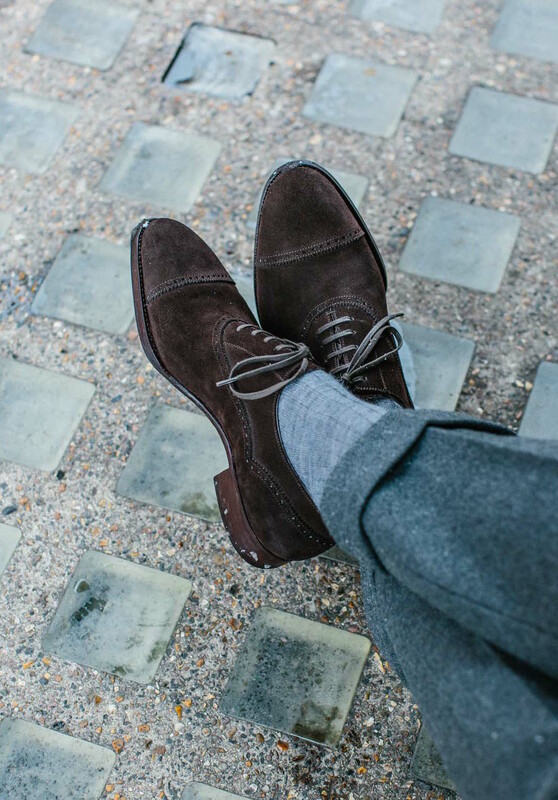 When I received by suede cap-toes (below) I knew exactly what to expect, and I’m wearing them in gradually and satisfyingly. The second area is hand dying. Saint Crispin’s start with natural-coloured crust leathers for their shoes, and then dye them individually, once the leather has been cut into the shoe’s constituent pieces. This creates a natural variation in the finish, and makes it a little less colour-fast. Most other makers get dyed leathers from the tanneries instead, and add variation with burnishing, finger polishing, or a painted patina. When I first bought my wing-tips, and in my first review, I talked about how much I liked this process because it meant the shoes had a personal colour, and looked aged very quickly - as some of that colour faded with wear. Over the past two years it has occasionally been annoying, largely because the shoes need more cream and polish than other brands to maintain the same look. I know this is something that puts others off too, particularly if they didn’t realise this in advance and were buying into Saint Crispin’s more for the value or the personalised last. However, I’ve come to accept this aspect of the shoes, and even love it. I’ve learned to use cream (such as Saphir Pommadier) a little more than I would on other shoes, and to leave areas like the vamp to crack and fade while I keep the heel and the toe polished. It’s also worth pointing out that any brand that does a hand-patina finish on their shoes is doing a very similar dying process, and that too needs more careful upkeep (as mine, for example from Berluti, G&G or Corthay, also have). Elsewhere, my view hasn’t changed that Saint Crispin’s is great value for money, given it is hand welted and handmade generally, with a personalised last that can approach bespoke for fit. The design choices and ranges of materials are also great. 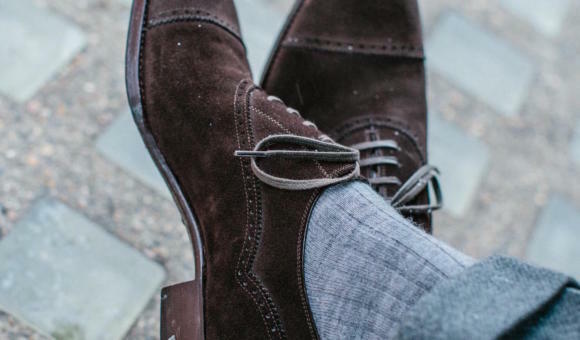 With my cap-toes, for example, I went for a finer, more closely cropped suede (‘Hunting’) than with my chukka boots, given they were a smarter model. I just need to find a way to get Saint Crispin’s stocked in London now, so I don’t have to do everything remotely. I may well have experimented with a different last, for example, if I had a range of them close by. You can follow the discussion on Saint Crispin’s shoes: Reflections two years later by entering your email address in the box below. You will then receive an email every time a new comment is added. These will also contain a link to a page where you can stop the alerts, and remove all of your related data from the site. Hi Simon – I too have 3 pairs of St C, sourced via Drakes, who sadly no longer offer this – do you now deal with them direct? I ask as the website suggests this option is not available. It would be great if it was, as their standard last works for me. The shoes are great – my only gripe is that one pair was made in the wrong colour – black suede instead of brown ! Is there a particular reason for them not having any UK stockists? I guess in part I cannot think of any physical store retailer that stocks multiple higher end brand shoes outside of the big department stores which is probably a roadblock. Exactly – there are no multi-brand shoe stores here, which is a shame. Thanks Simon. On a related topic – can one use Saphir renovateur without sripping off the old polish from shoes, and does the Pommadier reduce the need to use renovateur ? Depending on wear and storage, Renovateur should be used a couple of times a year as it removes dirt, restores the original colour to the leather and nourishes too. Pommadier will not nourish in the same way, but will absorb marginally better than paste. Equally it will not buff to a shine to the degree a paste will. Do you know why they are not in London? Vass shoes are similar but now readily available in London. Personally, I think it is a risky business to do things remotely especially with shoes hence I havnt bought from them- please find a way for them to come here perhaps via trunk shows! Paddy not sure what you mean when you say Vass are similair to SC but i do agree with simon in terms of “breaking in” and the fact that the finish is a bit delicate. (I thought i ruined the “patina” on one of my SC’s when i used the saphir cream but it was easily remedied by using a butnof a darker wax polish on the toe, vamp and heal areas. What I mean is that Vass too are hand-welted, hand-lasted and hand-soled. There are a few bits of similarity between the two. brands. The advice that I have been given by companies that sell other makes of crust shoes is not to use a renovating cream, for the reason you suggest. The advice I have been given is to stick to mild shoe creams. The green cotton trousers look interesting. Is it a heavy winter cotton ? Did you have them pleated with side adjuster ? I have had some trousers made by Whitcomb & Shaftesbury and had then described recently as ‘very English’ . I probably need to be clearer on what I want next time. I have also had some trousers made recently by Elia – absolutely superb at the same price as W&S. Hey. No, flat front with Daks buttons on the side – just because the material was too thick for regular adjustors. Would love to read some more on daks vs side adjusters. I’ve heard very different things of daks, some good, some bad. Overall that they give a better and more consistant fit than side adjusters, less pulling the trousers up required, but that the elastic band tend to get worn out. In general, I prefer side adjustors as I don’t like the elastic of Daks. I prefer a solid close fit rather than something stretchy. But on thick cloths side adjustors don’t really work well. I apologise, I understand this post was really on shoes but I have a few comments on trousers. My question therefore is (money aside) should I be having all my trousers made bespoke and my MtM/ RTW trouser adventures are ignorant and misguided? Thanks for sharing this experience. An opportunity I would seize on to ask you whether there is a difference between St Crispin and British shoemakers in the way they construct their uppers. The British makers are known to make thicker uppers, which I personally prefer. But I suspect that St Crispin make thiner ones – as French or Italian shoemakers usually do. I wouldn’t be surprised if it is so, as new St Crispin shoes would then need a greater deal of time to break in. Love the chukkas Simon, M&S have just released something quite similar, worth looking into if cant afford the crispis price point! The Alligator shoes you have on here Jeffrey West do something very similar but a little more pointed, more to my tastes really. Are M&S goodyear welted? Wow thanks Simon! Ive never heard of Cockett and Jones but I will give them a bing search. Why should STC be so expensive? from what I can see they are no different to Jeffrey West, are they bench made as well? I really like the appearance of the uppers that SC achieves through their process of building up the colours by hand. It produces a richer and more interesting look compared to using leather died by the tannery. And as for them demanding more polish and attention – I’d welcome that as there’s a real satisfaction from polishing shoes well and achieving really good results. It’s a pity that SC aren’t more accessible for us in the UK. What’s your view on Vass shoes? Think they have opened recently a small shop on Savile Row so interested in hearing out your thoughts or feedback you have heard from others you trust. I have several pairs of Vass, and theee pairs of StC. Vass is fully handmade, so also the sole seam which is machine sewn on StC. The finish on Vass is less refined, no burnishing, only solid aniline leather. Also much less ”rigid” construction, not as much arch support and not as tight waist. Also less consistent in sizing between pairs, but exceptionell value, especially when bought from Vass directly. I stopped buying from Vass now, and actually replace pairs with StC, but mainly due to fit problems from my hallux valgus (personal last from StC). If your like Vass estetics and fit well in their lasts, they’re a bargain. Konichiwa Simons, I have 6 bespoken pars of STC schus and am love with all of them, they all pythons make. looking for pars of chinchiwa shoes and want you recommend me some good maker and manufacturer. It’s great reading about how these shoes approach bespoke fit through careful last adjustments. I’ve recently commissioned a pair of chukkas via mail from bespoke maker Jan Kielman and will be improving on the fit for my next pairs. The value they provide is really good, for what is basically a bespoke shoe, just without the high markup for the fancy details. I can see myself ordering many more pairs from them once I get my fit dialed in (my feet are a bit oddly shaped). This strikes me as a very similar experience and process you’ve been going through. Have you perhaps considered commissioning a pair of shoes from Jan Kielman? I’d be very interested in your opinion on their product. 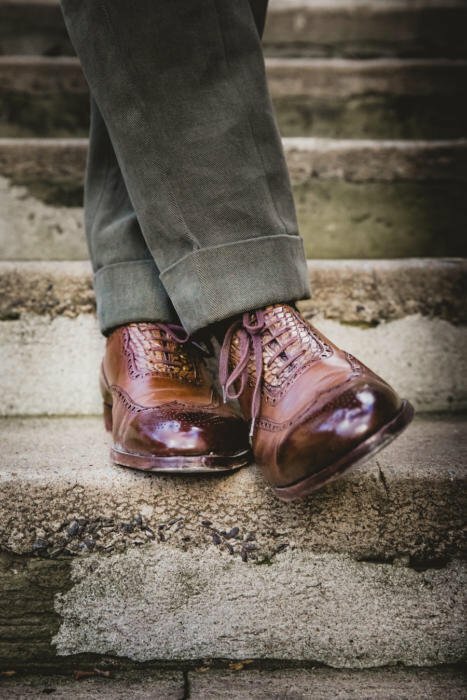 To me at least, this post also offers a new opportunity to really know, based on your own experience and what you have gained so far from the shoe industry itself, what the true and incontrovertible facts about the difference – or differential benefits – between hand-welted and goodyear welted shoes. Sorry to resume with this topic. But I’ve read so contradictory statements about it, that I can’t honestly say with high confidence what should a PS reader has to know. Thanks, Simon! That would be of great interest! Thanks Simon for this post. It really helps crystalize my decision to order something from St. Crispin’s this April. One quick question: with regard to upkeep, do you apply the cream polish and then polish it to the high shine with water? Skoaktiebolaget shows a price at €1,356. The cost is good when compared to the bespoke offering in central London but the factory is in Romania (average p.a. wage €6,180 so 25% of UK average wage plus lower costs and overheads. Turnover is approx. €2 million so 25 staff x average =€154,500, €100,000 for rent and overheads, €50,000 materials plus another €100,000 for unknown = total costs €404,000. That leaves 300% profit markup). You may respond with ‘it doesn’t matter where the factory is’ but the issue is mark up over cost – is the price comparison to local RTW offerings (Lobb, Cleverly, Green, Trickers) therefore fair? I’m afraid these costs seem pretty much like a stab in the dark. There are many inaccuracies and omissions, among them the fact that you would not pay the average wage for what is a skilled job to produce a high-end product, and that there are no costs for administration, sales or marketing, travel, waste, prototyping, design and so on. Fundamentally, mark ups simply don’t vary that much between brands in this area. The mark up is similar, and the quality is easy to judge. So it’s just a question of whether you care that it is made in Romania rather than the UK. We can debate costs but your points are detailed and reasonably made. I have gone to your other posts on StC. and understand your points re. quality, particularly on construction. I remain a little confused however by the differential between the StC. approach and ‘full bespoke’ in StC. a personalised can be made, shoes are formed to the last, colouring is in-house, construction is by hand, shaping is of a high quality and designs can be personalised. What then is missing from the StC. process that does not make it bespoke (accepting that time on the last may be shorter)? Sole seam on StC is sewn by machine, which you would not see on a bespoke shoe. Perhaps not very important since they are hand welted, but nevertheless. Your 2-year reflection gave me hope to continue with the St.C, having rapidly graduated from RTW. I would like to add a reflection for people who are contemplating a switch to St.C from RTW brands, based on my own experience. St.C fits VERY precisely, and if the fit is off by a millimetre or so, expect to fight it for a while. It will more or less settle with time. My second pair, on an amended personal last, still require modifications, while I have heard of people still adjusting their last on the 4th or 5th pair. Sometimes, the fit can be made worse in certain spots. My personal last, which was an amendment from an MTO pair, constricts the ball left foot significantly. This issue is slowly fixed through wear, but it was very uncomfortable at the start that my toes actually became quite numb. Having said all that, I would concur with how beautiful the St.C are, and how well they kept their shape. It’s now very hard for me to go back, and I’m looking forward to wear them for years to come. I was looking for a post on shoes where I could ask a question about shoes; rather, a few questions. firstly, on formality – would it be correct to say that calf or smooth leathers would be more formal than pebbled grain or, otherwise, textured leathers, which would, in turn, be more formal than suede? Also on formality – would a penny loafer be considered more formal than one with tassels? Lastly on formality, which would be more formal (if either) – a round toe or one more angled or square, such as a chiseled toe like the Cleverley toe or the square deco of G&G? I would also like your take on which one would be more versatile – smooth leather v grain leather v suede, penny v tassels, round toe v chiseled? On durability, with all things being equal, what is the longevity and practicality of an unlined shoe v one that is lined? I know that an unlined shoe has a more softer structure an is lighter, but is it also less durable, would it be considered more fragile, and then less formal? Also, is an unlined shoe considered more of a spring summer shoe, or is it permissible and/or desirable to wear it year round, assuming winters are relatively dry even if they are cold? I realize that there are a lot of questions to think about and that there are other factors that may come into play for both formality and durability, but I am hoping for some guidance. For example, how would a plain calf penny loafer compare against one that is a pebble or hatch grain against one that is in suede? 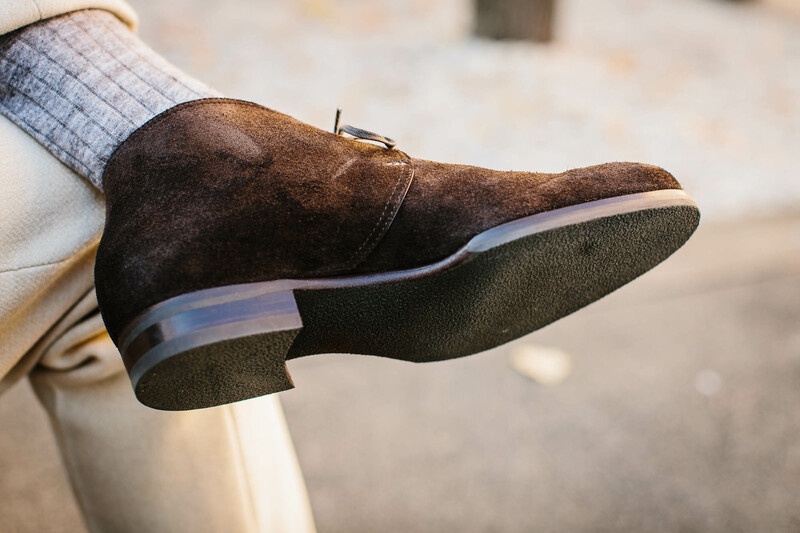 Would a tasseled loafer be less formal in suede than in calf and would it, in turn, be less formal than a penny loafer (I know that you are not exactly enamored with tassels)? I hope that I have not totally muddied the question and that my line of thinking is a bit clear. Thank you in advance for your thoughts on the subject. – In general, suede would be more formal than most textured leathers like grains. Smooth calf more formal than both. – On penny loafers, not a big difference between that and tassels really. One is cleaner, but often seen as more casual culturally. You could wear an unlined shoe whenever you want – no one’s going to see inside! But yes, they will possibly not last as long, and not maintain such clean lines, or support the foot as much. Thank you Simon. That was quite a comprehensive answer. Much appreciated. On colour, what would your ranking be vis-a-vis versatility? Would a mid brown work best? How much lighter or darker? Would the colour used for the G&G Crompton be among the more versatile colours? What about a non-brown colour, such as navy, tan or even black? Thank you Simon. I was glad to hear that it will be offered by G&G. I’ve always liked it and it is on my list of shoes to get. I have flat feet and no essentially no metatarsal arch because of it. I find it really hard to find a last that I fits properly with out leaving a gap underneath the tongue and on the outside quarter of the shoe. Do you know of a last/brand that has a flat and narrow build? Or is there another remedy to this issue? Thanks Simon, I will have to do that. Sterling, I have the same issue – fixed by a really good podiatrist who made me some removable orthotic inserts. Once you have those, you can swap them between shoes and will need to take them with you to try on new RTW or MTO shoes, but will also find with some shoe brands that the orthotics push your feet up slightly out of the shoe or against the upper and tongue, so willneed to compensate by choosing a style you can break in and stay comfortable in. The alternative to using orthotics is to go bespoke, with the sock (the section underneath the foot) being adapted to give you the exact arch support. You will need a good bespoke maker who is prepared to make repeated adjustments to get the fit right. Hi Simon, do you mind sharing Loro Piana Green Cotton # for reference? Thanks! Thanks a lot Ben, really helpful. I'll fix that now.